The Common Threads Challenge - Linkup #1. Happy Hump Day!! Today is the first linkup day - every Wednesday with myself and the other 5 remixing bloggers from the Common Threads Challenge - I mentioned recently in my Currently post. This is a different kind of remixing challenge. Created and originated by ALEX of The Cheerful Closet, this Fall style challenge will join 6 different bloggers - all of which have done other capsule challenges before - to bring you an innovative, unique and fresh idea about how to remix your closet while still wearing anything you love from your entire closet. 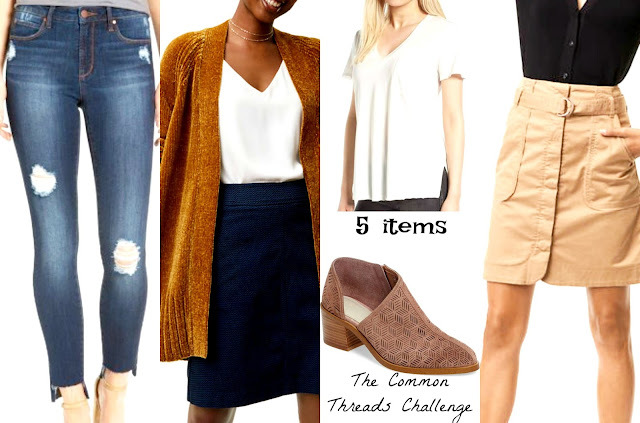 How it works is that we each get to choose 5 different pieces from our closet (it can also be an accessory as one of the pieces, not just clothes) and wear at least one of these 5 items with other items from our wardrobe, every single day. My Raw, Step-Hem Distressed Blue Jeans are by Wit+Wisdom - a very reasonable brand sold at Nordstrom. Mine were purchased a couple of months ago during the big Nordstrom sale and I cannot find them online actually. But this pair I linked, also by Nordstrom, is by the brand Leith and they are also very reasonable and quite similar to mine. My pair is in a medium wash, the Leith pair is darker. These jeans are so comfortable and fun you guys. Slightly edgy and perfect for a mom on the go. This Ever-Popular Chenille Cardigan is so soft and beautiful. It comes in a dusty rose color and a sort of woodsy mustard that Loft is calling Autumn Ochre (pictured on the collage). I purchased both colors from Loft for 50% off each. But these soft, comfortable, beautiful, luxe cardigans are totally worth the full price - 60 bucks each. Since this is the same cardigan and I know I will be wearing it a lot during this remix challenge - which means I have to wash mine a few times - I decided to use both of my cardigans (both colors) as one of the 5 items. Call it cheating or whatnot but I had to include both. Plus if I had picked just one, I wasn't sure of which color to choose. I have already worn both cardigans for a total of 4 times and even posted part of the outfits on my Instagram. This V-Neck Pocket White Tee is one of those pieces that goes with everything. It is definitely a staple in a woman's closet and I especially think moms should own one or a similar one to it. I have already worn it 3 times during this challenge. It is perfect for the warm days of Fall we have been having and for in between seasons/weather. It is a great everyday piece to use for layering and you can also dress it up - trust me. Though these tees are a great price, I purchased mine for even less during the #NSale. Mine is the Raw Edge V-Neck Tee with the side slits, but it also comes in a deep v-neck with a curved front, slightly longer on the back - this one. These Perforated Asymmetric Booties are perfect and so versatile. They seriously go with everything. The mauve color is between a blush, a lavender and a taupe - neutral enough yet their soft hue gives you a pop of color. I have worn them with shorts, dresses, jeans, cropped pants and skirts. You have already seen them on the blog too and I have worn them at least 2-3 times (prior to the challenge) not blogged. They come in 6 great colors for Fall, all mostly neutrals. I purchased mine for about 90 bucks during the Nordstrom sale, but they are so well-made and 100% suede so I would even pay full price for them. This Cargo Khaki Skirt is Fall perfection. Between the utility style, pencil length and shape, the pockets and the soft comfortable material, it makes the perfect skirt to style for any season really and the khaki shade is a great color for Fall. The possibilities with this skirt are endless. You can wear it for mom days with sneakers, sort of dress it up with booties or completely dress it up with pumps and a blouse (you can add a blazer too) for work. Last but not least, we have also opened a Facebook Group about "The Common Threads" challenge which you can all join - even if you don't have a blog - and you can post your OOTD photos there too. You can also join or tag us on Instagram. 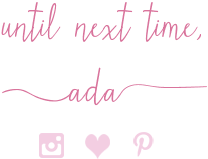 And now you can join the linkup below and don't forget my weekly Thursday Moda linkup goes live tomorrow morning at 6.00 AM Central time.